There are new makes and models of smartphones and tablets coming out every week. At last count there were well over 4,000 manufactures and models that could access the Silvertrac App via the Google Play store or App store, so it is feasibly impossible to track the compatibility of every single new model that comes out. It’s easier to share the basic App requirements. The basic App requirements are that the device must have (1) a rear and forward-facing camera, (2) GPS, (3) internet connection capability and (4) the ability to upgrade to the newest operating platforms. Almost all newer smart phones have these aforementioned features and are compatible with Silvertrac. Basically, a good rule of thumb is, if you see the app available in the App Store or Google Play store on that phone, it is compatible. 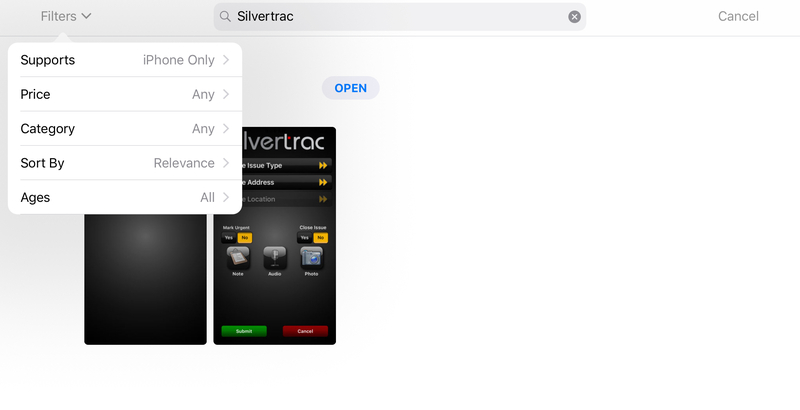 You can still use Silvertrac or an iPad! iPad – “No Results" In the upper left had corner of the page you'll see the Filters drop down turn from Grey to Blue, allowing you to select the "Supports" tab. It will display "iPad Only". Select it and change the setting to "iPhone Only" and the Silvertrac App will display for download. NOTE: The Silvertrac App downloaded on any new device will require approval by a system admin before it can be accessed and used.